You should not have a problem finding inclusive Norwegian cruises from Miami. In fact, the Miami Cruise Port is the most popular departure location for Norwegian cruises leaving from Florida to the Bahamas, or the Eastern or Western Caribbean. 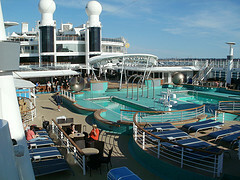 Norwegian Cruise Line has come a long way in the cruises it offers to the Caribbean. Whether you wish to take your family to the Bahamas, a western Caribbean port of call such as Grand Cayman, or an eastern Caribbean destination like St. Thomas, Norwegian offers inclusive Caribbean cruises to all those destinations. The slew of inclusive Norwegian cruises from Miami include sailings of various lengths. You can find 3-day sailings, 4-day sailings, 7-day Norwegian cruises and even longer cruises such as 10-days or 11-days to the Eastern Caribbean. By the way, you may be happy to know that Norwegian's longer cruises include ports of call in the Southern Caribbean such as Barbados and Curacao. 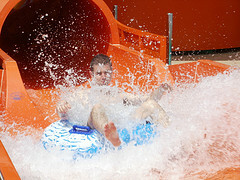 Norwegian Cruise Line offers family friendly cruise packages. My family sailed with the Norwegian Dawn to the Eastern Caribbean on what was our third inclusive Caribbean cruise ship vacation, and it turned out to be one of our best cruise vacations. Our kids enjoyed the youth program and we enjoyed the ship's layout, the entertainment, the service and the choices in cruise cuisine - of course. Norwegian is famous for "Freestyle" cruising. Unlike some cruise lines where you may sit for dinner at the same table, with the same people for the duration of your cruise, on Norwegian you choose when you want to go and you certainly do not sit at the same table every night. Also, unlike other big names in the cruise industry, Norwegian does not have a night where you feel compelled to dress up. Dress anyway you want, with some common sense of course. Go casual all cruise long! Freestyle cruising is loved by many, especially younger cruise passengers. 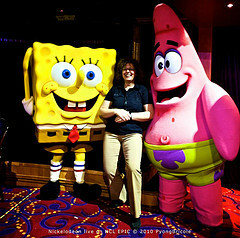 Something else that many have come to love about Norwegian Cruise Line is the Nickelodeon Cruise. Like Disney Cruise Line that offers a fun-packed cruise adventure with magic and fun characters, Norwegian has brought Nickelodeon characters alive at sea. If your children enjoy SpongeBob SquarePants on TV, they will enjoy Norwegian's Nick Cruises. Finally, Norwegian cruises are usually great on price. In fact, you can expect to find highly competitive cruise prices between Norwegian and Carnival Cruise Lines' itineraries. Carnival generally has the best cruise prices, but Norwegian is a close second, sometimes even offering better cruise deals than Carnival for the same itinerary. Norwegian currently has four of its popular ships sailing from Miami. You can choose from the Norwegian Pearl, Norwegian Sky, Norwegian's biggest cruise ship - the Norwegian Epic, or the their newest ship, the Norwegian Getaway. You will love your ride! Note: All ship listings below are subject to change, as Norwegian re-positions its ships at will. Norwegian offers 3-day and 4-day Bahamas cruises from Miami. Cruises to the Bahamas include a stop at Norwegian's private Bahamian island, Great Stirrup Cay. You will even find Norwegian cruise sailings to the Grand Bahamas Island. Really? Norwegian is one of few cruise lines that visit the this Bahama island. Norwegian Cruise Line currently offers 7-day cruises from the Miami Cruise Port to the Western Caribbean. Your cruise itinerary will include popular ports of call such as Ocho Rios, Jamaica, Grand Cayman, Cayman Islands and Cozumel, Mexico. Ocho Rios, Jamaica; Grand Cayman, Cayman Islands; and Cozumel, Mexico. You can find 7-day Norwegian cruises from Miami to ports of call in the eastern Caribbean. You will also find longer sailings with stops in Barbados and Curacao, islands in the southern Caribbean. Tortola, BVI; St. Thomas, USVI; and Nassau, Bahamas. In addition to the cruise offerings listed above, Norwegian offers longer cruises aboard Norwegian Pearl to ports of call in the Eastern and Southern Caribbean. 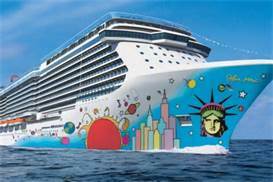 Note: Later in 2015, Norwegian will add its newest ship, Norwegian Escape, to Miami. Also, the Norwegian Epic will be re-positioned to Europe after its 2015 Caribbean season. There is much more that can be said. However, we hope that you have a great starting point as you search for a Norwegian cruise package that works best for your family. I guarantee that you will have a great cruise vacation on any inclusive Norwegian cruise from Miami that you choose.